If you love Gospel music, you won’t want to miss Nathan Best as he performs with the Golden Gate Gospel Train 2001 Mass Choir on July 21 at Ashibina Hall in Okinawa City. World renown as a Gospel musician, Nathan Best’s mother started him singing at age 3 and he led a song on his mother’s record at age 5. He has since sang for the well-known Hawkins Family and later joined the legendary O’jays. Since then, he has felt led to become a pastor at the New Beginning Church in Nashville, Tennessee. 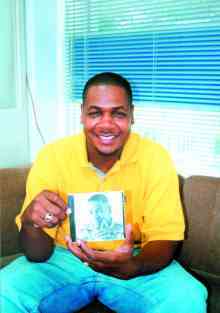 With a smile, Nathan shows an article he is particularly pleased about which was recently published in the popular American gospel magazine, Gospel Today. It is about his success and the Japanese gospel movement. “Gospel music is finally starting to take on in Japan and we thank the Lord for that,” says Nathan. The workshop will take place from July 17 to 20 culminating in the Golden Gate Gospel Train event at Ashibina Hall on July 21. The first stage will begin at 3:00pm and the second stage will start at 6:30pm and will feature the talent of Nathan Best, the Golden Gate Gospel Train 2001 mass choir, the Taiyo-Fu Orchestra, and Parsha Club. Advance tickets can be purchased at the Ashibina Hall Box Office for $20.00 or you can purchase tickets at the event for $25.00. One song from this month’s workshop will be featured on Nathan Best’s upcoming album “Nathan Live in Japan” scheduled to be released by the end of 2001. The album will consist of ten live songs recorded at concerts in Japan and seven studio recordings. Nathan is considering doing a World Gospel Festival next year with some friends in the gospel scene, but says, “We’ll see how everything goes from here.” If you miss the Golden Gate Gospel Train concert but would still like a chance to see Nathan play, come check him out as he performs a piano and vocal concert at the New Life Chapel in Naha on July 22 from 3:00pm to 4:00pm. More information on this event can be found by calling the New Life Chapel at 098-857-5570.